Over the years, Steinberg's venerable cross-platform Cubase product line has seen its fair share of naming tweaks. Back in 2002, Cubase VST 5 was superseded by a radically overhauled 'reboot': Cubase SX. A few versions later, and the 'SX' was dropped, resulting in Cubase 4.0. Now v8 is here, but while still available in the familiar pared back 'Artist' incarnation, the top of the line earns the new designator of 'Pro' and a price increase to match. Both are excellent - though not flawless - products and will happily serve as the hub of your musical productions without requiring you to look beyond the bundled instruments and effects. With these eight tips, we aim to give you the knowledge and inspiration to try a few new things in your Cubase-based production sessions. For much more on Cubase Pro 8, get your hands on Computer Music 216, which is on sale now. Quadrafuzz is an old Cubase favourite from before the turn of the Millennium. This nifty distortion unit was based on a design by DIY wunderkind Craig Anderton and made available as a kit long before being recreated in virtual finery by Steinberg. Quadrafuzz, now at v2, makes a stellar comeback in Cubase and it's chock full of features that make it more useful than ever before. One of our favourite flourishes is the delay included on every band. You can easily set up complex frequency-dependent syncopated echoes, ideal for adding some urgency to an analogue sequencer track or texture to a thick synth pad. Compressors and limiters are crucial components in today's productions. However, there are fewer dedicated expanders out there, at least not by that particular name. Many common noise gates are actually expanders - a 'downward expander' to be precise, reducing the level of signals that fall below a specified threshold. Pretty useful for knocking back headphone bleed on a vocal track or background leakage on individual drum tracks. The Multiband variant gives you the ability to select the material to be expanded based on frequency range - even better, then, for those recording live drums. You can knock down, say, the cymbal bleed in a kick track without adversely robbing the signal of its low end decay. Tape echo effects can add space and depth to a mix. Quadrafuzz V2 doesn't pretend to be a tape echo emulation but, as it happens, it's pretty damned good at it! Moreso because it can easily emulate the dirty, gritty sound of battered old tape machines that are likely to be found on the used market. For a truly dirty effect, activate the delay sections' Feedback With Distortion modes, so that the signal degrades with each repeat. Try mixing Tape and Tube distortion for a sound not unlike the famed Echoplex EP-2. The infamous "gated snare" sounds of the 1980s are easy to achieve: simply slap a gate after a snare recording that's heavily processed with reverb. The most famous example was created using an SSL console's listen mic compressor on the room mics during the recording of Peter Gabriel's The Intruder. 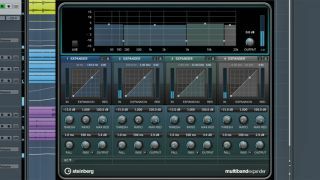 You can take that idea a step further: strap the Multiband Envelope Shaper onto a heavily reverbed drum mix and tweak the parameters of the individual bands. The results can be most unusual! The Multiband Envelope Shaper is not unlike other envelope shaping plugins we've used, and as such, it makes a fine transient shaper. However, unlike a typical transient shaper, it's split into four user-definable frequency bands. This means that with careful adjustments and a bit of luck, you can use it to effectively shape, say, the individual drum sounds in a drum mix. More than that, it makes a really cool means by which to apply some clever filtering to your drum loops. Many of you will doubtless have used a noise gate as an effect in its own right by feeding an external control signal through its sidechain input. It's a neat if somewhat over-used effect. You can breathe some new life into the technique thanks to the Multiband Expander's quartet of sidechain sections, each dedicated to a selectable frequency. This is useful for achieving subtler, more textural gating effects. Give it a try on frequency rich signals. Today's mixes are sometimes less than dynamic. Modern ears demand that songs be perceived as loud and impactful, often achieved through aggressive compression and limiting on the master output. If you're a conscientious objector in the so-called loudness war, you might find the Multiband Expander to be the perfect tool for re-introducing some dynamic range to tracks or samples that have been overcompressed. The new Bass Amp suite of modelled amplifiers, cabinets, mics and effects is a real coup for you four-string fans. It can be used to craft the perfect bass recording rig. Yet that isn't its only talent - you'll find that it can also liven up funky synth bass riffs, or add a bit of grit to a tom track. Heck, you might even try it on vocals!